While putting away laundry it occurred to me that I have sewn a couple things in the past months. 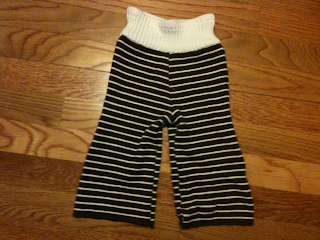 This is a pair of baby pants crafted from two sweaters. They are nice and thick for cold days. 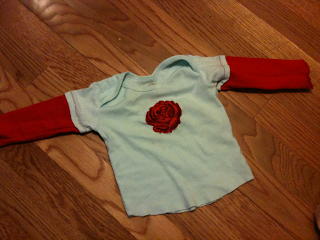 I also made this shirt by starting with a onesie, cutting off the snaps, adding the sleeves and the rose applique. I am always happy to see her wearing these little presents from me. these are both so cute! love the little pants!